Do you really enjoy struggling with public transport? Are you looking forward to taking your luggage on the tube? Perhaps you’re concerned about the traffic on the M25 and possible delays? If you are looking for a relaxing, stress free transfer from your home to your cruise ship’s departure port then let Evo Chauffeurs look after you. You can travel in real style. Choose between our Executive E Class Mercedes and 5 Series BMW or a Luxury model S Class Mercedes or 7 Series BMW. For larger groups wishing to transfer we can also offer a comfortable Mercedes Viano and our driver will be pleased to do multiple pick-ups. If you are starting or ending your cruise holiday anywhere within the M25, let us handle your cruise transfer. We have a fleet of luxury BMW and Mercedes cars so you can travel to your port in sheer luxury. Enjoy the elegance of soft leather seats and the comfort of air conditioning to start your holiday the moment you get into our car. If you are travelling to London for an overnight stay, we will collect you from any hotel in central London. Your driver can also do a sightseeing tour around some of the best known sights and places of interest. Do you fancy struggling across central London? Trains for cruise departures from Harwich leave from out of the way Liverpool Street. If you don’t fancy dragging across London on the tube with your luggage then why not book a luxury transfer that picks you up in person? It’s not as costly as you might think and is also a great way to start your holiday. Dover and Southampton are south of London. If you want a relaxing, speedy trip to your cruise ship, our luxury BMW and Mercedes cars will get you there in style. Spacious and comfortable take the M25 and the rest of the motorway network in your stride as we look after the driving. An Evo Chauffeur transfer is cheaper than you might think. You can find out how reasonable the cost is using our online quotation system. Just enter in your details and we’ll get back to you with a price in a jiffy. We know how important transfers for a cruise are so we make booking and paying for them extra easy. 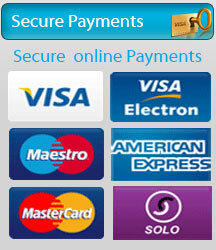 Our secure, online booking and payment system takes all major card types.